A brush fire is leading to more evacuations. 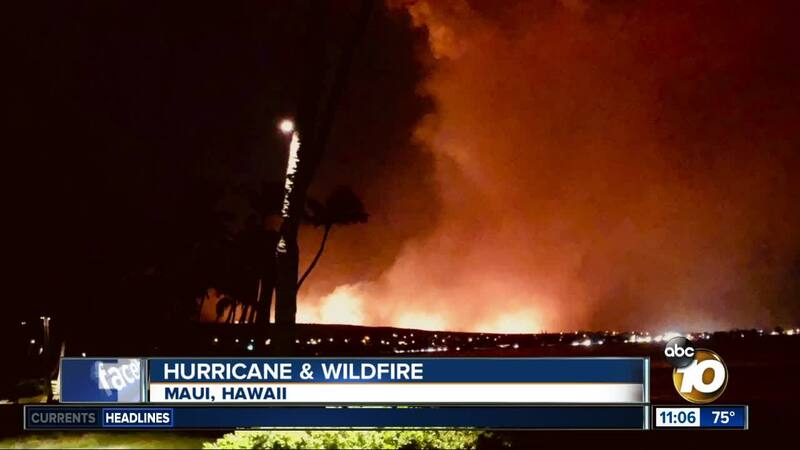 LAHAINA, Maui (KGTV) - A wildfire put a twist on the Hurricane Lane response in Maui Friday. California resident Victoria Monroe is visiting Lahaina and posted photos to Twitter showing high winds slamming the Maui coastline. She also captured the brush fire moving toward the coast. The fire grew to 300 acres by Friday morning, with reports of structures lost. One woman suffered burns to her hands and legs. 10News received an email from San Diego resident Jodi Vachon who owns a home in the fire area. "I'm just worried about not only the hurricane but the fire as well. So, it's coming from both ends," said Vachon. Vachon told 10news her home is all right, but she's heard from neighbors in Maui that at least two homes have been lost. She said they're hoping Hurricane Lane will bring some heavy downpours to the burn area. Meanwhile, travelers at San Diego International Airport are prepared for a bumpy ride as they board flights to Honolulu, where the effects of Lane have yet to interfere with flights. "I like a little rock and roll," said Dr. George Pratt, a Clinical Psychologist with Scripps Hospital in La Jolla. He flew to a lead a seminar on the big island of Hawaii on the subject of success. As for a successful flight for nervous fliers, he said, "Meditate. See things with positive end result imagery. See things working out well."